New Yorkers know that Zephyr Teachout is challenging incumbent Andrew Cuomo for Governor in the primary next week. That challenge is linked to her book – – – entitled simply Corruption – – – just published by Harvard University Press. When Louis XVI presented Benjamin Franklin with a snuff box encrusted with diamonds and inset with the King’s portrait, the gift troubled Americans: it threatened to “corrupt” Franklin by clouding his judgment or altering his attitude toward the French in subtle psychological ways. 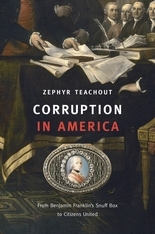 This broad understanding of political corruption—rooted in ideals of civic virtue—was a driving force at the Constitutional Convention. Interestingly the New York Times did not endorse Teachout because her focus on corruption made her too narrow, but it did not endorse Cuomo, seemingly because his focus on corruption was not sufficient. Teachout’s running mate, also a law professor, did garner the NYT endorsement. (more, with links, here). This entry was posted in First Amendment, NYC on September 2, 2014 by Ruthann Robson.